Pharrell Williams has created two macarons flavors for his fans in Paris: cola and peanut butter-flavored macarons. To help celebrate his four-night concert run in the City of Light this week, the singer and style icon partnered with French concept store Colette and Ladurée to release a series of limited edition macarons, à la Americana. The peanut butter and cola-flavored treats are available in Paris exclusively at Colette. 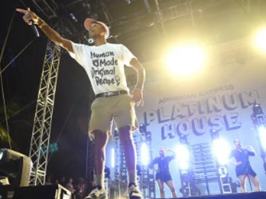 Pharrell wraps up his ‘Dear Girl Tour’ with four dates in Paris, ending October 16. A box of six Pharrell macarons costs €17 and is available for a limited time.